Milwaukee Tool continues to expand its 12-Volt Lithium-Ion system with the introduction of the new M12 Variable Speed Polisher/Sander. Optimized to provide the fastest and most precise detail work, the new tool performs the work of two tools in one by easily switching between polishing and sanding modes. As the most compact cordless polisher on the market, the M12 Polisher/Sander is the perfect complement to a full size polisher for a faster finish. Featuring Dual Mode Control and a variable speed trigger, the M12 Polisher/Sander delivers increased user control, regardless of the application. A tool-free accessory change allows the user to quickly change between polishing and sanding accessories. The Bosch PS22-02 12 V Max EC Brushless Two-Speed Pocket Driver provides outstanding power for the most compact and lightest weight Drill/Driver in its class. At only 1.6 Lbs. and with a head-length of only 5.3 In., this cordless drill is great for contractors or MEP pros who have extended overhead or hard-to-reach applications. Yet this mighty mite packs an EC Brushless motor that delivers 180 In.-Lbs. of torque. The two-speed transmission has a high-torque setting for driving and a high-speed drill setting, and it has 20+1 clutch settings for max versatility. The pocket driver has a 1/4 In. quick-change hex to boost productivity. The added belt clip and bit holder provide portability. The kit includes two 12 V batteries and a charger for all-day work. Cutting faster, cleaner and closer than traditional methods, the new M12 Cordless Lithium-Ion PVC Shear by Milwaukee utilizes a super sharp stainless steel blade for burr-free cuts, slices through 2-inch PVC in as fast as three seconds flat, and offers an offset blade to cut PVC mounted to a stud or close to a wall. Powered by a Lithium-Ion battery, this new PVC Shear is able to cut over 200 times on a single charge. 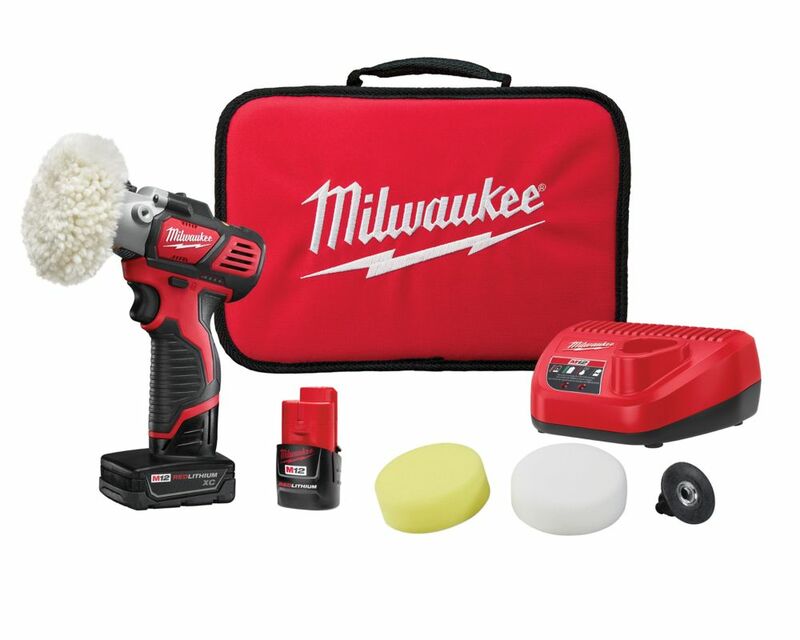 M12 12V Lithium-Ion Cordless Variable Speed Polisher/Sander XC/Compact Battery Kit Milwaukee Tool continues to expand its 12-Volt Lithium-Ion system with the introduction of the new M12 Variable Speed Polisher/Sander. Optimized to provide the fastest and most precise detail work, the new tool performs the work of two tools in one by easily switching between polishing and sanding modes. As the most compact cordless polisher on the market, the M12 Polisher/Sander is the perfect complement to a full size polisher for a faster finish. Featuring Dual Mode Control and a variable speed trigger, the M12 Polisher/Sander delivers increased user control, regardless of the application. A tool-free accessory change allows the user to quickly change between polishing and sanding accessories. M12 12V Lithium-Ion Cordless Variable Speed Polisher/Sander XC/Compact Battery Kit is rated 4.4 out of 5 by 31. Rated 3 out of 5 by Frankolvera114 from Battery life still needs work, and sand paper for that... Battery life still needs work, and sand paper for that size it’s expensive, that needs a lot of work, so it could be an item that makes sense to buy. Rated 5 out of 5 by Richard from Nice powerful little buffer/polisher, absolutely perfect for small areas like... Nice powerful little buffer/polisher, absolutely perfect for small areas like headlights. Rated 1 out of 5 by Curtis from Only 4 minutes run time. Machine became too hot... Only 4 minutes run time. Machine became too hot to hold at the top. Rated 5 out of 5 by Paul from Very handy tool! I’ve used the sander several times... Very handy tool! I’ve used the sander several times and it works Great! I haven’t had a chance to try out the polisher yet!